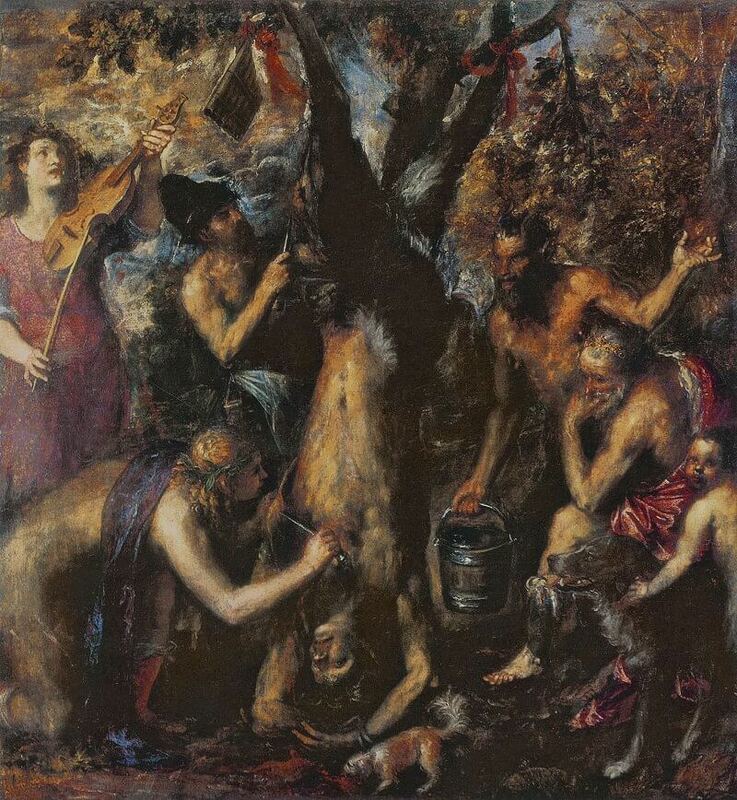 The Flaying of Marsyas is the painting that the novelist Iris Murdoch once declared to be the greatest in the Western canon. It was painted by Titian in old age, and its patron is unknown. Like other great, late works by Titian, it was a painting to which he returned again and again over about a decade and a half, modifying it, perfecting its details. Also in common with those other great works, and in spite of the fact that it was long in the gestation, it has an air of frenzied activity about it, not only a frenzy in the making, but also a frenzied scene coming into being as he laboured. The painting itself is cluttered with a cast of many, beasts and humans, some participating in the terrible, stomach-churning rite of meticulously flaying flesh from the bones of a living thing, others merely looking on meditatively. The story is from Ovid, and it is one of great and sustained cruelty. Though we catch it at a particular moment, we know that this flesh will be long in the stripping and the unpicking. Here is how this monstrous scene came to be. A contest has taken place between the satyr Marsyas and the god Apollo. Marsyas had discovered a set of reeds abandoned by Minerva. He learns to play them so well that he is foolish enough to challenge the god Apollo to a musical contest. Apollo agrees - but on condition that the victor will be able to inflict such punishment as he chooses upon the loser. Predictably enough, Marsyas loses, and Apollo inflicts his gruesome punishment, which is to flay Marsyas alive, stripping flesh from bone, inch by meticulous inch. Ovid barely mentions the contest, though he does describes the scene that Titian paints in some detail: "'Help!' Marsyas clamoured. 'Why are you stripping me from myself? Never again, I promise! Playing a pipe is not worth this!' But in spite of his cries the skin was torn off the whole surface of his body: it was one raw wound. Blood flowed everywhere, his nerves were exposed, unprotected, his veins pulsed with no skin to cover them. It was possible to count his throbbing organs, and the chambers of the lungs, clearly visible within the breast." We see every bit of it in the painting. As the skin is peeled back, a small dog - pretty as any duchess' lap dog - licks eagerly at the rich, tasty blood. A horned and bearded satyr with a cold, malevolent eye carries a gleaming bucket to the scene. What is that bucket for? It all adds to the feeling that this is an almost forensic and unstoppably gruesome operation. Two parts of the huge, elongated body of Marsyas, a satyr with the black, hairy legs of a goat, are being worked on simultaneously. An extraordinarily young and sweetly innocent looking Apollo - recognisable by his laurel crown - combs away at the flesh with his gleaming blade, in rapt concentration. He could be sitting for an examination. The scene feels crowded, hurried, almost wind-buffeted - the limbs of trees seem to be tossing and swinging. The huge figure of Marsyas himself, hanging upside down, hairy legs splayed, dominates our gaze. He looks so beautiful, so noble (not for long), and as wearily resigned to his fate as any Christian martyr. That sense of frenzy is in part to do with the way that it is painted. Titian's biographer Vasari gave us a glimpse of Titian's working methods around the period that this painting was being worked on. "His recent paintings," he wrote in the 1560s, "are executed with broad, sweeping strokes, and with blobs of colour, with the result that they cannot be viewed from nearby, but they appear perfect from a distance." Vasari thought this "judicious, beautiful and astonishing". The brush strokes are often loose and agitated. There are flecks of white highlights almost everywhere, snow-like in their effect, which make almost everything appear to glint and and dance. The huge, slavering dog at the king's knee seems to be straining to lap at that blood-soaked patch of ground. The painting when seen close to looks as if it might be unfinished - or perhaps abandoned. It is so finger-smeary and agitated. Everywhere there is pain, lust and cruelty.